Cedar roof sheds are a simple way of enhancing the look and durability of your new shed. 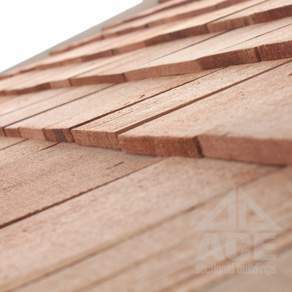 Cedar shingles are tapered wood pieces made from red cedar which are used to cover the exterior of both roofs and walls. Available in the form of tiles and ridge tiles, they can protect your shed from all types of weather, especially rain and snow. Cedar shingle fabrication involves saw-cutting and knife-smoothing by hand to get the thin and smooth protective texture for the roofs which makes it an excellent lightweight solution. Cedar shingle roofs are an attractive and durable roofing option that will not only protect your shed or summerhouse for longer but also prove to further enhance its look. The natural wood will already complement your garden but over time it gradually weathers to a subtle colour to further blend into the surrounding environment. Alongside their aesthetic appeal the shingles have acoustic properties that are great if your workshop doubles as your teenager’s band rehearsal space, or houses your power tools. At Ace Sheds our cedar roofs contain natural preservatives to ensure weatherproofing but for extra peace of mind you can also buy pressure treated shingles that are unlikely to ever need treating with any preservative in future. Great for the cold winter months, cedar roofs made out of shingles have great insulating properties that allow you to carry out activities in the shed for longer periods. And during summer, the shingle material prevents the heat cracking the roof and causing leakage during rainy days. Pressure treatment to the cedar shingles makes them strong and highly resistant to different weather therefore giving a long-term maintenance-free performance. Furthermore, these shingles are very easy to handle as they can be fitted and rearranged by yourself without any professional assistance. This type of roofing can now be made available for any new garden building, from sheds to summerhouses, and given the fact that they will effectively provide a roof for life they are well worth considering as an investment. How Ace Sheds can help with supplying a shed with a cedar shingle roof? Just ask for cedar shingles as your roofing option when you make a purchase from Ace Sheds, and we can install this attractive roofing option to your new garden building.